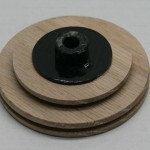 We now offer custom whorls for the Bumblebee, Honeybee and CraftyBee to increase their flexibility. When you you order a 12:1 and higher ratio we include a High Speed Drive Band at no charge. It is red in color so you can identify it right away!! Scotch Tension is necessary for the faster whorls to work. They will be made to order in pairs. ie. 12:1 and 14:1. Two speeds per whorl is max. The speeds do not have to be close. ie. 10:1 and 18:1, if that is what you want.